A summer's day in France is never complete without an evening apero and there is nothing more quintessentially Provencal than a pre-dinner pastis. With the sun working overtime in July and August, it is not unusual to go to a late dinner just as the skies turn a bright tangerine orange. By the time the plates have been wiped clean with some bread, the shooting stars have started to fall. But before that – when the afternoon air comes to a standstill and the bugs quiet down in the fields – friends, families, and couples flock to the village bars and hidden gardens for l'heure de l'apero. Apero is short for aperitif, a French word from the latin aperire, meaning 'to open'. The idea being that it would 'open' your appetite, whet your tastebuds, and put you in the mood for food. In Spain, drinks have been accompanied by tapas for centuries, and in Italy it has now become common to stuff a full buffet meal in with your spritz. In France, the focus is more on the cool, smooth drink. The aperitif was actually first formulated by a French chemist in 1846 named Joseph Dubonnet, who introduced his eponymous quinine-containing wine as a way to combat malaria. His wife loved the taste and helped spread its popularity by sharing it with all her friends and soon the Dubonnet-based aperitif became a staple in all the cafes of France. Many concoctions of the day, like another favourite of mine, gin and tonic, were actually sweetened deliveries for bitter medicine. While Dubonnet was gaining popularity and being used by the French Legion, British soldiers in India began mixing water, sugar, lime and gin with quinine to help down the bitter taste and the gin and tonic was born. In a random case of recent British-French amour, the Queen Mother supposedly enjoyed mixing her own drink of 30 per cent gin with 70 per cent Dubonnet over ice and a slice of lemon. In the south of France, however, it is pastis that reigns at l'apero. At every other bar table you will see a glass half-filled with milky cream and a carafe of water next to it. More often than not, the glass or the carafe will say Ricard. Paul Ricard dominated the apero scene in the south by bringing the anise-heavy drink to its shores in 1932. There must be something about the Mediterranean air that encourages a penchant for anise-flavoured drinks such as Greece's ouzo, Croatia's rakia, Turkey's raki and Italy's sambuca. 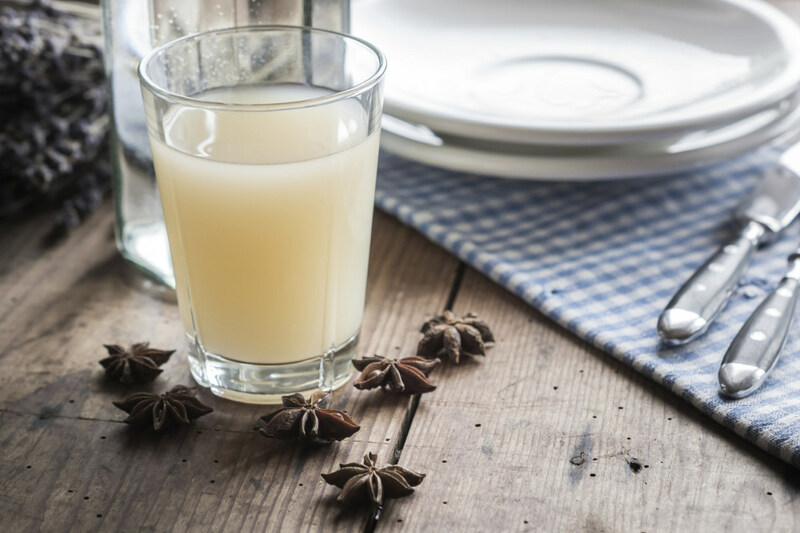 The word pastis comes from the langue d'oc spoken in the south (including the dialect Provencal), meaning 'mash-up'. Ricard was originally introduced to pastis by an old shepherd and later experimented with and perfected the drink in his bedroom by adding other ingredients, such as star anise, fennel seeds, licorice and herbs from Provence. The exact recipe remains a secret today. Pastis did not always have an easy time in France. The aftermath caused by absinthe, also an aniseed drink, led to aniseed-based spirits being banned during the First World War, and again in the Second World War for being 'contrary to the values' of Vichy France. As a testament to its popularity, it re-emerged after Prohibition to become one of the most-sold liqueurs in France to this day. After many years on the market, Ricard merged with its largest competitor, Pernod, to form Pernod Ricard in 1975 – now one of the largest drink companies in the world. Whether you spend your days exploring picture-perfect villages or lounging by the pool, everyone starts glancing at their watch around 7pm. The promise of ice cubes cracking in a milky haze as water is poured into a thin, tall glass beckons. If we are home, there will be a side of spicy black olives, crostini with green tapenade, salty rich anchoiade, and my favourite brandade de morue. If you are out, you must be quick to grab a seat with a view if you are in one of the guide-book darlings of Provence. Be it in the stunning hill-top rock village of Gordes or the gorgeous (but very touristy) Roussillon, it is likely that you will find a sign saying 'complet' unless you are lucky enough to have a 'post-apero dinner reservation'. If you are prepared to venture away from the beacons of gift shopping and photo viewpoints, the lesser-known paths will bring you to the hidden and quiet gems of the Luberon – Joucas, Saint Saturnin Les Apt, Caseneuve and Villars are a few of our favourites. Everyone happily sits down to catch up on their day and one empty pastis glass is replaced with another until there is one lonely pistachio left in the bowl and l'heure de l'apero turns into l'heure du diner. Fathom celebrates all the reasons why we pack our bags, get on a plane, hitch a ride, and explore beyond our backyards. Fathom is the travel website reinvented — through inspiring stories, practical advice, and useful tools and products. Fathom is where world-curious travelers indulge their passion for travel — whether they're getting on a plane tomorrow or staying at their laptop.